Good seating is important for a wide range of automotive tasks such as brake pad replacement, body work, and detailing. A long day’s work in the shop will take far less toll on your body if you can sit at a crouching height and roll around from place to place. The best creeper seat take things even further by utilizing a cushioned seat and integrated tool tray so you never have to worry about that socket or wrench being out of reach. TIP: Working under the car? Don’t forget the mechanic’s creeper. Tractor seats are quite popular among mechanics and architects due to their unusual ergonomic design. The Sunex 8514 is no exception. Using an air cylinder and easy-to-reach under-seat adjustment lever, the seat height can be adjusted from 18 to 22 inches. Heavy duty chrome castors ensure this seat won’t get stuck easily, while the rubber treads give extra grip. Finally, a one-inch deep, reinforced tool tray under the 16-inch wide seat makes this an excellent mechanics chair. If one word could be used to describe this seat, users will generally go with “comfortable”. This seat was obviously designed to be used for long periods of time, and bears up well for heavier owners. Pretty much all of the complaints about this chair have revolved around its casters. The size compared to the seat width means there’s a chance you can fall off when shifting your body weight too fast. A couple users noted the bearings actually fell out after some time, forcing them to search for compatible replacements. Fortunately, this appears to be an uncommon scenario. This racing-inspired seat combines comfort, aesthetics, and functionality into one amazing product. Starting with large 5-inch casters made of hard TPR synthetic rubber, this stool gives excellent mobility and stability. A large, revolving gear tray provides easy access to all of your tools. Thanks to the dropped sleeve, the seat can be adjusted from a low 13 inches up to 18 inches. And speaking of the seat, the design is racing-inspired, heavy-duty, comfortable, and even has a carrying handle built into the backrest. When you need something that can bear a lot of weight and still give great comfort, the 400-pound limit and cushioned seat make this a perfect choice. Owners like the ability to remove the tray when not using it, and Traxion customer service has an excellent reputation for addressing issues quickly. Due to the very low base height, this chair makes an excellent replacement for your current creeper stool, as well as a great general-use working chair. Casters are again the primary issue. It’s easy to put the bolts on backwards, leading to numerous stability issues. In many cases, the casters have actually fallen out of the chair, causing it to tip over. Hopefully, this will be an issue that’s addressed in future batches. Note: When ordering this product online, you may get an older design from a seller’s warehouse. Traxion has an excellent reputation and is quick to send you updated parts if you receive an older version. The current version has an improved seat design that fixes an older problem with the hydraulic cylinder, as well as some other possible improvements. Torin has a good reputation for building good quality creeper seats and stools at an affordable price. 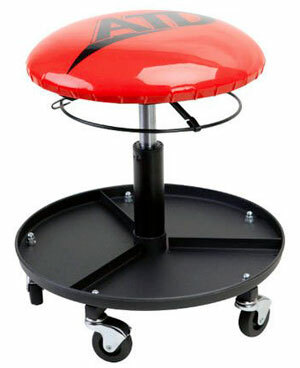 This mechanics stool has a thick vinyl padded seat for optimal comfort. An easy-to-reach level lets you adjust the height from 16 to 21 inches. Heavy duty two-inch casters allow the chair to move around easily, and a large, segmented tool tray gives you the ability to sort and access your tools effortlessly. Finally, the all-steel construction means this chair will hold up to some serious abuse. When you want a great all-around stool, it doesn’t get much better than this. The simple design means it’s easy to assemble and has fewer things that can go wrong. The height range also makes it good for detailing your car. Unlike most of the seats in this list, the TR6350 is a lightweight, with a max capacity of only 250 pounds. This might not be a problem for lighter individuals, but it does severely limit who can use this creeper stool. There have also been rare issues with the pneumatic lifting system, causing many users to be unable to retain their preferred height. 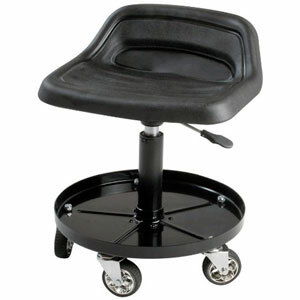 This super popular steel mechanics creeper seat has all-steel construction for improved durability. Unlike other creepers on this list, this has a wide, rectangular padded cushion. The steel frame will hold up to a lot of abuse, and its square design allows for a larger tool tray that sticks out less. 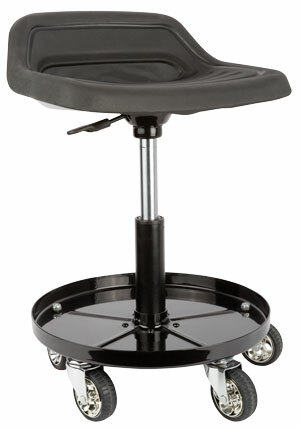 Four 2-inch casters provide more stability here than on rounded models. Finally, the seat is a non-adjustable 14.5 inches high. So while you won’t be able to adjust the height, you also don’t have to deal with any potential pneumatic lift issues that are common with other creeper seats. Despite being a shorter height, this creeper actually has a wide range of uses. Owners have used it not only for detail and mechanical work, but it has also serves well for plumbing, laundry, and other tasks which generally require stooping or kneeling. The overall quality is excellent, and the shape makes it far more difficult to tip than other creeper seats. Owners have generally been very happy with this Torin product. The biggest issue is that the tool tray is made of a thinner plastic and may be prone to breaking. Also, a few users have reported the hardware used for assembly isn’t the best quality. But for a simple, cheap creeper seat, this one is hard to beat. 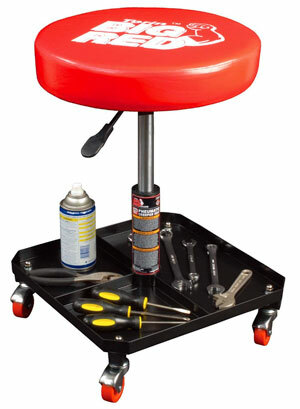 This mechanics stool is built to not only be comfortable, but also durable. The thick, multi-layered padded vinyl seat is designed to hold up under pressure. 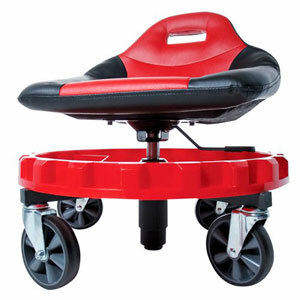 Five 2.5-inch swiveling casters help ensure great mobility with a reduced risk of toppling. A lever under the seat allows you to easily change the seat height between 15 and 20 inches. The tool tray is broken into six sections with small dividing bumps so you can organize tools without needing to stand larger ones. Finally, the steel frame is sturdy enough to hold up to 300 pounds, and heavier owners note that the stool holds up very well without losing comfort. 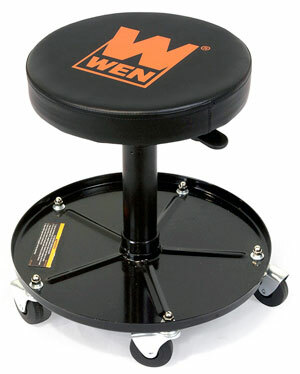 In terms of a general all-around stool, the WEN 73012 can handle a wide range of functions outside of the shop. Inside of a workspace, users report that it’s the perfect height for a lot of mechanical work. If you require a substantially higher height for sitting at a workbench, a stationary shop stool would be another option. There have been some quality control issues with this stool, usually revolving around welding points. Whether these are simply duds that slipped past inspectors or is indicative of a larger problem is unknown. In several cases, shipping was responsible for damage to the stool, so this might also be a factor in the welding issues. If you spend a lot of your day working on cars or at a low table, the comfortably padded ATD creeper seat is a good option. With an adjustable 16 to 21 inch seat height, even taller individuals will find it comfortable. 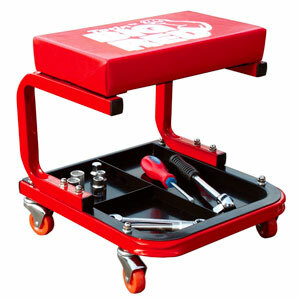 The well-designed metal tool tray beneath the seat is as convenient as you will get in a roller stool, and allows you to keep working and stay organized. Assembly is easy and owners note the quality of parts and especially the seat padding is above average. The biggest disadvantage of this rolling creeper seat may be the casters. They are a little too soft so they will probably be the first thing to fail at some point, especially if you’re on the heavier side. The good news is that they are easy (and cheap) to replace with heavier duty wheels from a local hardware store. When the pros and cons are tallied, this is still one of best creeper seats for the money and it comes from a company with an established name in tools and equipment.